Straight hair expert, beautician lecturer and a global inspiration in hair straightening techniques, Yuko Yamashita said, "through working with Sunsilk on the creation of this newExpert-Perfect Straight range, I have sought to re-create the magic moment between wet and dry hair, when your hair looks perfectly straight and beautifully aligned". To achieve this much sought-after balance, the Sunsilk Co-creations Expert-Perfect Straight range has been formulated with advanced Straight Lock Technology, which actively controls and gently binds hair together into a simple and elegant, straight style. The process begins with Expert-Perfect Straight Shampoo which, whilst cleansing the hair strands, activates Straight Lock Technology to penetrate deep within the hair fibre and straighten the locks. Conditioning with Expert-Perfect Straight Conditioner, seals in the straightness, whilst controlling how your hair dries, by penetrating into the hair fibre, hydrating each strand from root to tip. To compliment the wash and care routine, Sunsilk and Yuko have created the Expert-Perfect Straight Detangling Mist, which is specially formulated to manage and detangle messy hair on-the-go. Its light, non-sticky texture means you can easily refresh your look anywhere, anytime, whether your hair is wet or dry. 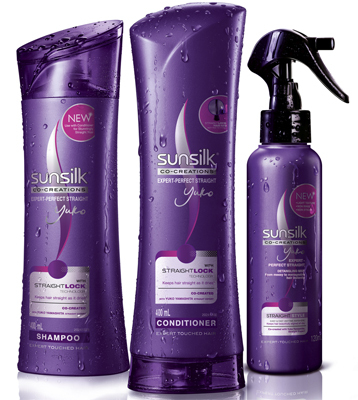 Of the development of the Expert-Perfect Straight range, Carol Mcweeney of Research and Development at Sunsilk said, "Managing and maintaining the straight shape of your hair as it dries is a technical challenge for many women. Sunsilk's latest Expert-Perfect Straight range with Straight Lock Technology is an advanced product that will save women time, when styling, by letting them control the shape of their straight hair as it dries." The Expert-Perfect Straight range is designed to enhance the straight shape of naturally straight hair and is not suitable to straighten wavy or curly hair.